(HILO, HAWAI‘I) – You usually hear them before you see them. There’s no mistaking the loud and often times synchronized cacophony of caws from eleven ‘Alalā released into a Hawai‘i Island Natural Area Reserve (NAR) last fall. 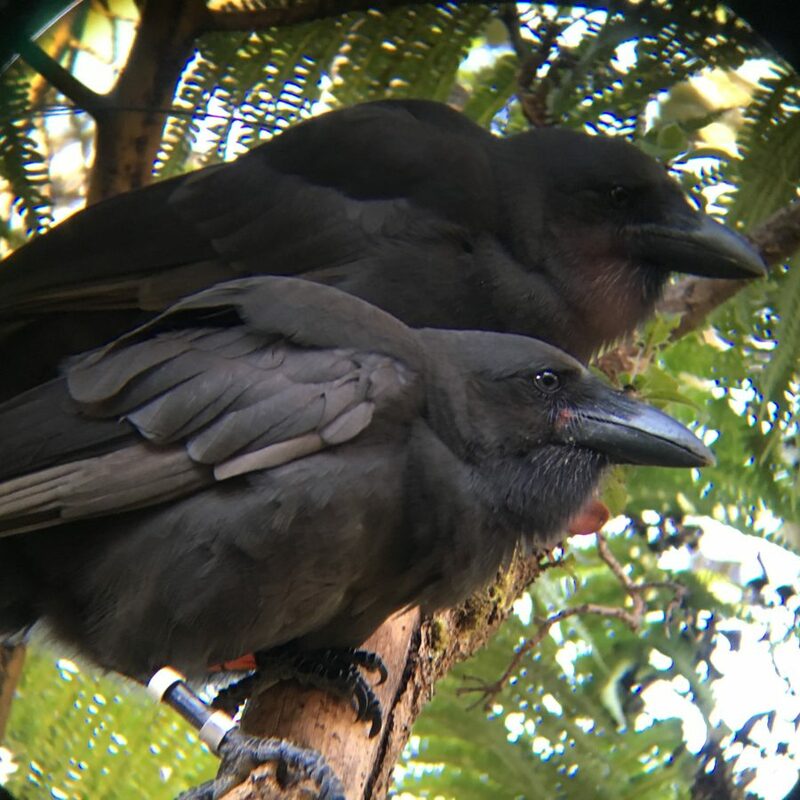 These birds, seven young males and four young females, represent what conservationists hope is the beginning of a recovered population of the endangered Hawaiian crow on the island. ‘Alalā have been extinct in the wild since 2002. Since the birds took flight from a remote forest aviary in September and October 2017, they’ve been under the daily, watchful eyes of a monitoring team from the Hawai‘i Endangered Bird Conservation Program, a field program of the San Diego Zoo Global (SDZG). In partnership with the Hawai‘i Dept. of Land & Natural Resources, the U.S. Fish and Wildlife Service and others, SDZG reared the ‘Alalā at its centers on the Big Island and on Maui. The ‘Alalā are tracked daily by using signals from the lightweight radio transmitters each one wears or simply by seeing them with the naked eye or through binoculars. Their movements, their flights, what they eat, where they roost, their behaviors; virtually everything about these birds is closely monitored and carefully recorded. Of high interest to all the folks involved in The ‘Alalā Project is how the birds individually and collectively react to threats from predators. An initial release of ‘Alalā in 2016 was temporarily halted and surviving birds were brought back into the aviary after two were attacked by another native bird, their natural predator, the ‘Io or Hawaiian hawk. Prior to their release, the birds now living in the Pu‘u Maka‘ala NAR received extensive anti-predator training. Another sign of how well they’ve accepted their new home in the forest is they are being observed foraging more often for native fruits, instead of relying on feeders placed strategically outside the release aviary. Joshua Pang-Ching, Research Coordinator for the Hawai‘i Endangered Bird Conservation Program noted, “In the beginning they would spend much more time at or around the feeders. Now we see birds coming to feeders much less. We have seen an anecdotal shift in their use of the feeders and see birds daily foraging on the fruits and foliage of native trees.” The supplemental feeders will remain in place for at least a year to ensure the newly “wild” birds have that extra helping hand they might need. It’s a sweet sound for the many people who’ve worked decades to get to this point. In time it’s hoped the distinctive caw of the ‘Alalā will again be heard loud and clear across broad landscapes of Hawai‘i island. Plans are underway to release additional birds in the NAR later this year.